"That's nearly 4,000 contacts with the world that my firm did not have." The "holy grail" of Killer Website Marketing for Attorneys is first page of the search engines in the search terms you want to be found for—or so they tell us. Is it worth the effort and expense? My small firm practice in a remote corner of North America may be a good test case for hype. Newfoundland and Labrador is a mainly island jurisdiction and relatively rural, with a population base of 500,000. Think parts of Alaska or West Virginia. Our reliable revenue stream comes from motor vehicle and malpractice cases, which enable forays into consumer class actions. My earlier site was passive and ignored. My Foster Web Marketing site is not. With the assistance of Ken Pearce and Gretchen Upright, the new site was up and running in mid-June 2008. 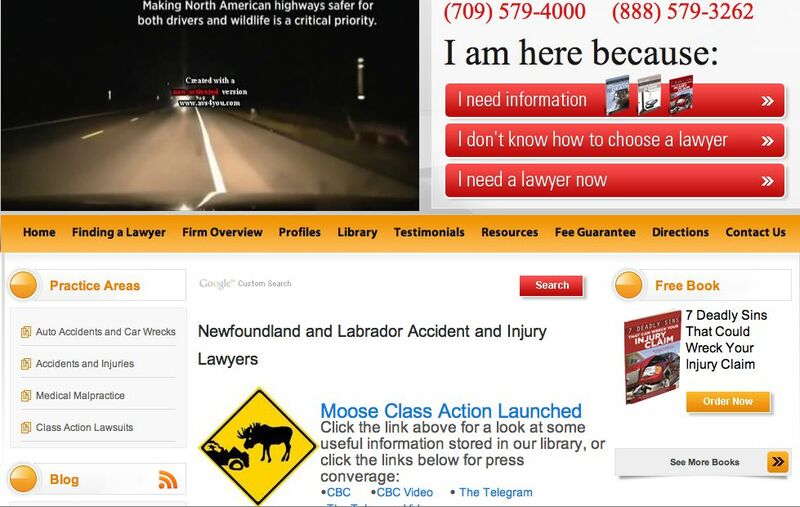 For search terms like "Newfoundland injury lawyer," it vaulted from obscurity to first page of Google and other search engines within days of launch. Warning: the following statistics (courtesy Google analytics) may appear puny to those with websites in sophisticated, tech-savvy urban areas. But 8% of my hits are from dial-up modems! In July, the first full month of operation, all traffic generated 464 visits and in November, 1,134 visits, with 3,794 visits for the six months to date of writing. That's nearly 4,000 contacts with the world that my firm did not have in the previous six months. The main purpose of having a website (or so I suppose) is to convert hits into clients, either now or later. Six month result: of 58 cases accepted by my firm, three originated from the website. Or I should say, reported to my staff that they originated from the website, because that's the way I have been collecting the data and the clients aren't asked if the site was a secondary source, we just record their top-of-mind response (needs improvement, I know). We received 363 book orders in the same period, 137 from my firm site or its cousin NewfoundlandInjuryBook.com, and 226 by telephone. What do I make of this? Well, in a small island jurisdiction, people know each other. Twenty-one percent of the terms used to find my site contain the words "Ches Crosbie" either alone or in combination with other terms. As well, prospects could be doing secondary "research" before making up their minds. I tend to think the site has generated more than the three self-reporters, but if it hasn't, is it worth the effort and expense? Well, at our average net profit per case, yes the site is paying for itself. That's the short-term analysis. But—as Ben Glass might argue—a comparison of the cost of the website (including the value of my time blogging and keeping it current) with average fees of cases generated is too narrow a standard of evaluation. There is value in adding those clients to a herd of fans. There is value as well in capturing the contact information of the hundreds of people who have ordered books, and in staying in front of them by monthly mailings. That's the long-term view. So yes, having a top rank website is worth it, even in a technology-constrained market environment where people know each other, provided your web presence is an integrated component of a marketing system with a unique selling proposition, which trades valuable free information for consumer contacts and does regular follow up to stay in front of the herd in an interesting way. Magic bullet, no; essential pillar of an integrated marketing strategy, yes. Ches Crosbie is leading a new generation of law firms in small markets that are making it big. The right strategy on the web can lead to more and better cases. But where do most firms go wrong? Find out in Tom Foster's free book 5 Mistakes 99% of Lawyers Make With Their Attorney Websites or give us a call at 888-886-0939.